Polish President Lech Kaczyński and 95 other people were killed Saturday, 10th April, when their government plane crashed in heavy fog near Smolensk, Russia. The group was planning to attend a commemoration of the WWII Katyń massacre near Smolensk. How safe is VIP air travel? Those aboard included the official delegation of 88 people and eight crew members, according to a foreign ministry spokesman. The president’s wife, Maria, and many prominent Polish political and business leaders were also aboard. Bronisław Komorowski, the speaker of the Sejm, is the acting president. Prime Minister Donald Tusk is leading the government and is cooperating with Russia in the investigation. The plane was a Tupolev Tu-154M. It is a Soviet-era airplane, designed to fly to airports in rugged and difficult to reach areas. 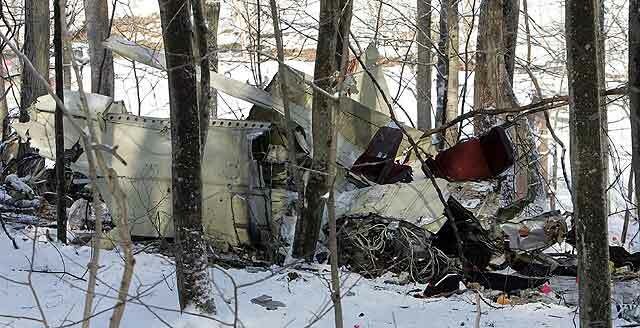 The president’s plane is thought to have clipped trees on a landing attempt in heavy fog and crashed. The so-called “black box” was recovered and sent to Moscow as part of the investigation. Video from the scene shortly after the crash showed firefighters battling fires and rescuers walking the scene as broken and blackened metal from the hull is clearly visible, though most of the plane appears to have been destroyed. The Polish foreign ministry and the governor of the Smolensk region said no one survived the crash. Authorities in Russia, under the direction of Russian Prime Minister Vladimir Putin, are investigating. Lech Kaczyński was 60. He was born on 18 June, 1949, in Warsaw. He was elected president in 2005 and faced a challenge in upcoming elections. Elections are now scheduled to take place in June. One other presidential candidate beside President Kaczyński was aboard. Komorowski has said a new slate of candidates will be announced after the mourning period ends 18th April. The family of the late president and his wife have asked that the presidential couple be interred in the famous Wawel Cathedral and the archbishop of the area has agreed, despite protests. A week-long mourning period began Sunday, 11 April, with flags at half-staff, many with a black ribbon attached. Mourners left flowers and candles at the presidential palace in Warsaw, Polish embassies throughout the world and in various sites throughout Poland. As well, many signed books of condolences in missions throughout the world. In Krakow, a special mass at Wawel Castle drew tens of thousands on Saturday, 10th April, the day of the crash. In the week that followed, throngs of people greeted the return of the bodies of his president and his wife to Warsaw and paid their respects at the presidential palace. The mourning period was extended midweek by one day to end at 9 p.m., Sunday 18th April, after the funeral for the president and his wife in Krakow. In Warsaw, a special mass and memorial services were held on Saturday. Prohibition on alcohol sales was declared for Saturday in Warsaw and Sunday in Krakow. Most places in central Krakow were closed. Traffic was blocked and rerouted because of security concerns. About 150,000 people gathered in central Krakow for the memorial mass and procession to Wawel Cathedral. During the night that followed the interment, thousands passed through the crypt to pay final respects to the president, his wife and the memory of those who died on 10th April and the victims of Katyn.